Salads that combine warm and cold ingredients make a healthy meal anytime of year. This Mushroom, Asparagus & Egg Salad is delicious, filling and easy to make. Now that the weather is starting to warm up (Spring seems be showing up early this year for us), my body is starting to crave more salads and raw veggies. It’s amazing how our bodies naturally want to cleanse themselves this time of year! There are so many combinations for making salads, that it’s difficult to tire of them. When I shared this picture of my mushroom, asparagus and egg salad on Instagram and Twitter earlier this week, I got a lot of comments about how yummy it looked! I even got a few requests for the recipe, so I agreed to share it with you today. One of the reasons I love this salad is because you can cook these ingredients ahead of time, which makes throwing together a salad for lunch each day super easy. I had to battle Kaylee for the asparagus – she wanted to steal all of mine! Wrap the asparagus and 1 teaspoon olive oil in foil, then roast at 350° F for 10-15 minutes, or until tender. While the asparagus is roasting, slice the mushrooms and saute in one teaspoon of olive oil until cooked. Cut the asparagus spears in half, then put on top of the spinach. Add the mushrooms and egg cup, then drizzle the remaining olive oil and balsamic vinegar over the top. 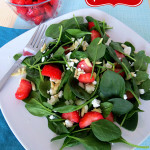 What are your favorite ingredients to include in salads? This recipe was created while serving as a paid blog ambassador for the Mushroom Council.